North Sikkim was awesome sauce, and when I was wondering what I would do on the next day of my trip, I got a call from my guide. He was a kind friend, and he recommended we visit South Sikkim that day. According to him, South Sikkim was a lot more beautiful than North Sikkim; I had to agree because I hadn’t seen it. It was time to remedy that. A three-hour long drive took me to the mountain where Temi Tea garden sits. India is diverse, you know? At one place there is black soil, and nothing grows, whereas at the another place conifers rise towards the sky. Coming from a place where 40 degrees Celsius is a standard temperature, seeing this mountain felt like heaven. 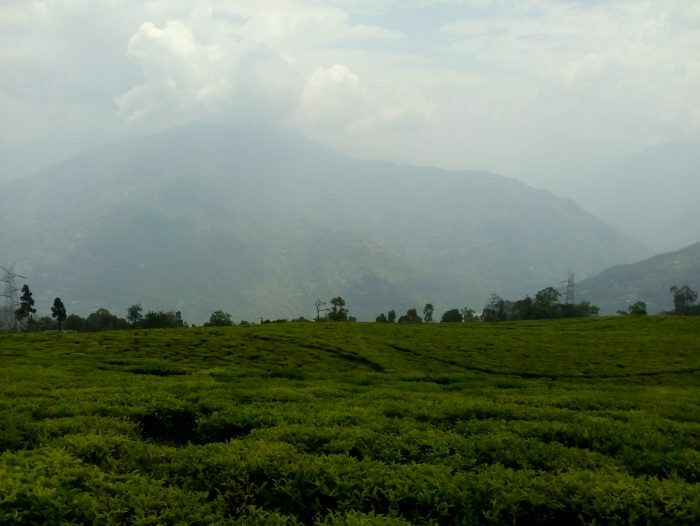 We drove higher and higher up the mountain, and then we came to the Temi Tea Garden. It was massive, and when you see the clouds kiss the vibrant green shrubs, it is heavenly. It is here that my sister stepped out and bought flowers, they weren’t from a high-end shop, but a street vendor. They were a pretty orange East-American flower (as the vendor named it). 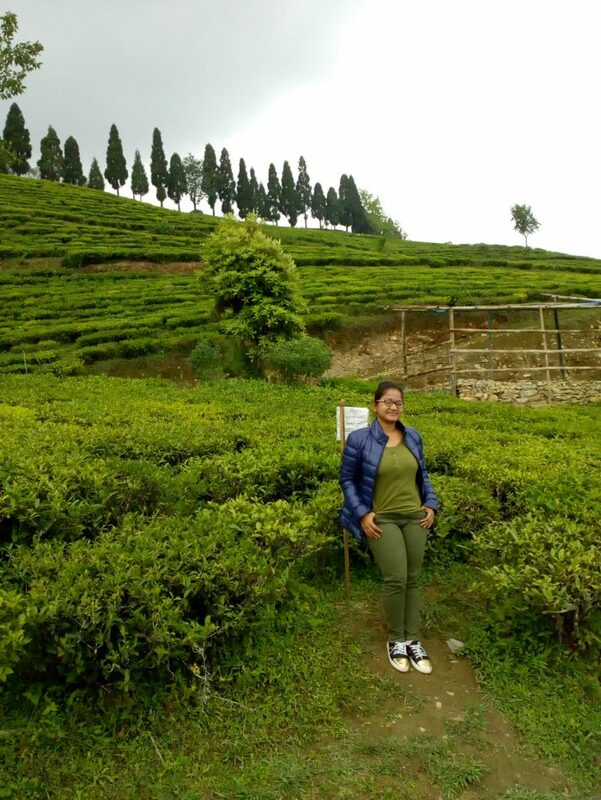 After wandering through the valleys of tea gardens, and seeing the Swiss looking lands, we were on our way to another hill. Hill hopping is common here, so there we went to our next stop – The Samdruptse. I will tell you; I have never been up in the mountains. So, walking or breathing at such a height was a chore for me. It is a miracle that I did not faint somewhere in the valleys. The height took its toll when we reached the hill of Samdruptse; I wasn’t able to control my breathing. On the internet, you might see that the height is 4,000 odd feet, but the actual height here is 7,150 feet. That is the highest I had ever been. You need to let your body catch up with the atmosphere before you get going. The giant statue of Guru Padmasambhava is here. There is also a temple beneath, where you can find the stairs to the top. You can click pictures from the statue where the view is magical. You can see the clouds floating between the valleys, and in the midst of it all is the magnificent statue of Guru Padmasambhava. Other than seeing the huge statue, and greeting the clouds, I also did something daringly stupid here. 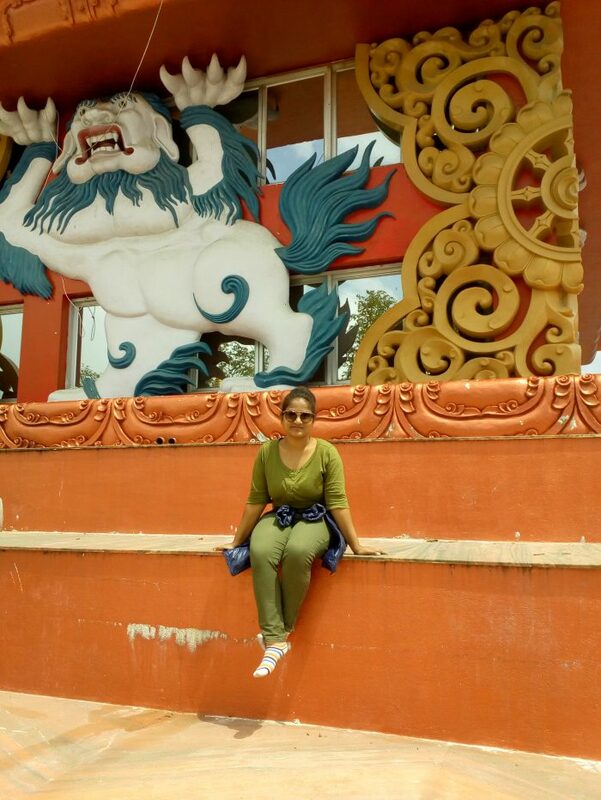 Most of the monuments in Sikkim get heavy protection. And before entering the temple, I sat outside one of the high steps of Samdruptse, as you can see in the pic. You know what happened? Don’t even get me started. I was just sitting there, ready with my sunglasses on when the Army guard charged in. I had no clue what I did wrong, and he was there charging towards me like an angry bull. He yelled “Yaha Nahin, Neeche!” meaning “ Not here, Get down!” And if I had not been scared out of my wits I would have taken some time to admire that fine frame of an army man. But I jumped down as fast as I could and ran into the temple. I am not a religious person. I do believe in God. And religion, not so much. 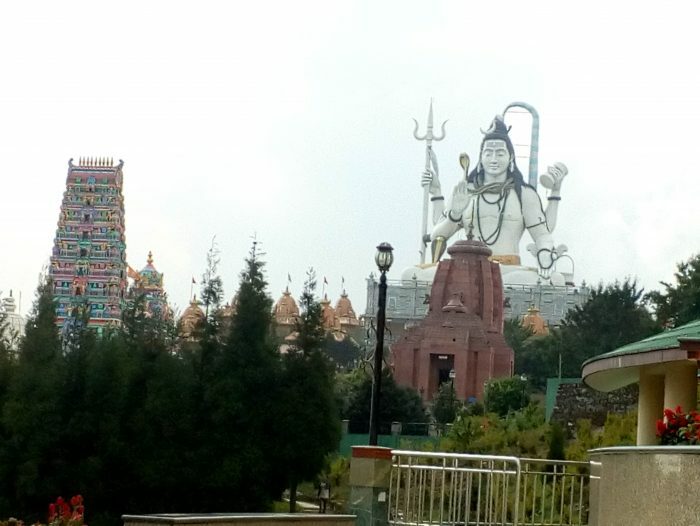 So, when my guide turned the steering wheels towards Char Dham, I was like “Stop Right There!” But he said that it was one of the best places in South Sikkim, and as a tourist, I should not miss it for the world. There we went to the place where I did not want to go. Arriving at the site did not elicit any excitement in me. I took a chance and went straight ahead to the ticket counter. When I saw it was all about temples, I skipped the tickets. Instead, I stood just in front of the Char Dham and clicked this splendid picture which encases all the four dhams (the four temples). Again when my guide parked the car at Baba Mandir, I groaned, I thought we were done with temples. Apparently not. 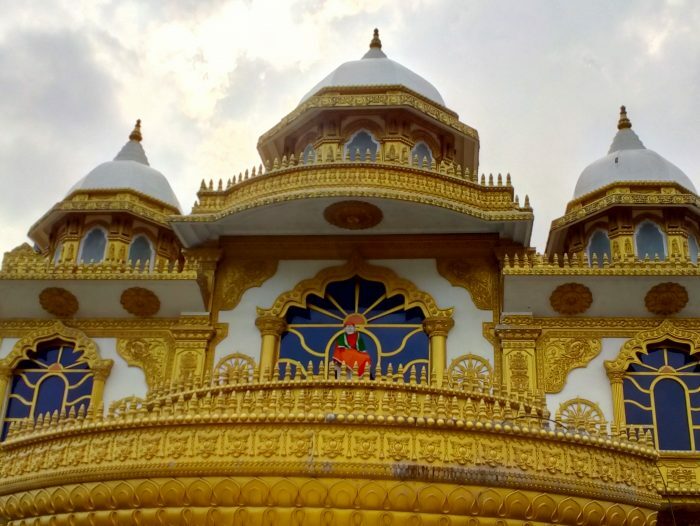 Yet when I stepped into the Baba Mandir a strange kind of peace descended on me. It was so peaceful in here. There were two floors of the temple. The picture above shows the ground floor where you can offer your prayers. On the first floor, there is a priest who offers you holy water. I didn’t go close to him, but my sister did. The thing I loved about the Baba Mandir was its ceiling. It had the galaxy painted on it, and it looked marvelous, to say the least. 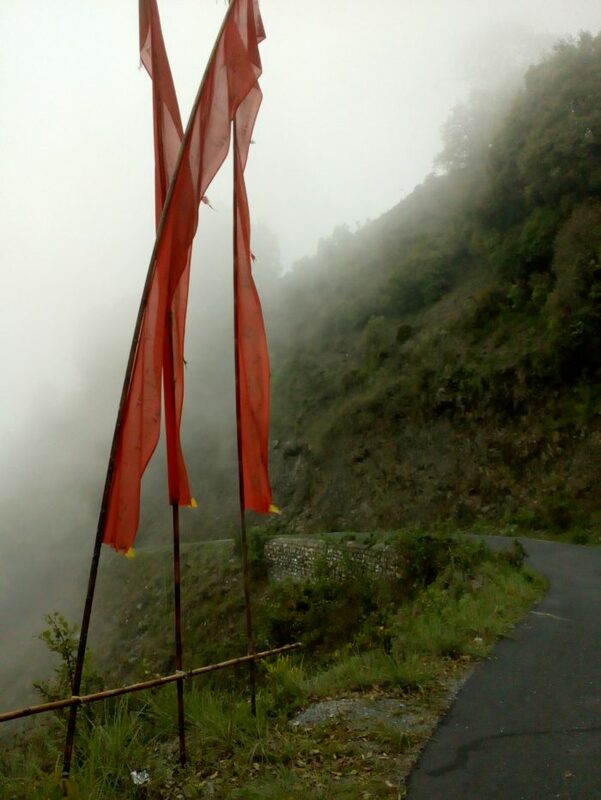 If you ask me what I liked most about my trip to South Sikkim, my answer will be – The Roads! 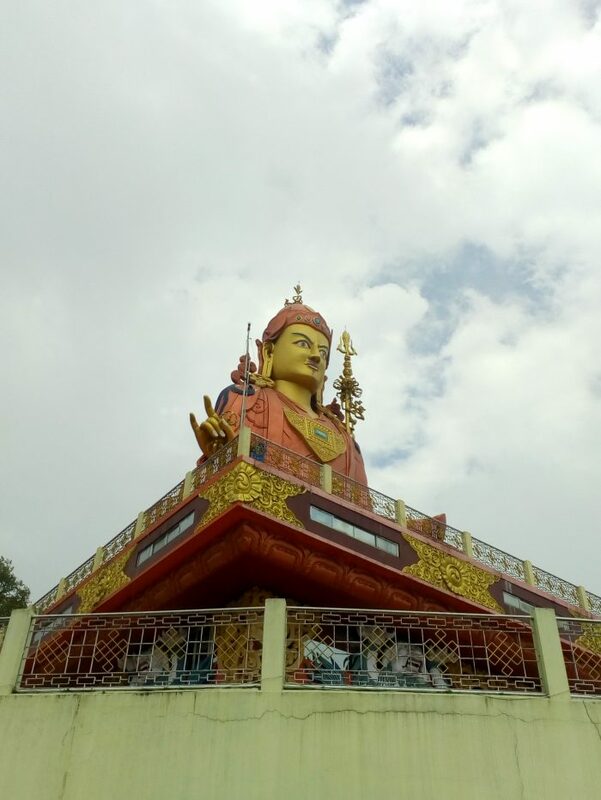 There are few places to visit in South Sikkim. But for a girl who has seen nothing except drought lands – the serene mountains were like manna for the starved. We drove through roads which had stiff bends with no warning of what was coming from the other side. It was scary; it was thrilling. On our way back, I didn’t want it to end. From the look on my face, my guard knew my mood. He proposed I get out of the car, and enjoy the view because it was the last I would get of the City of Snowy Peaks. 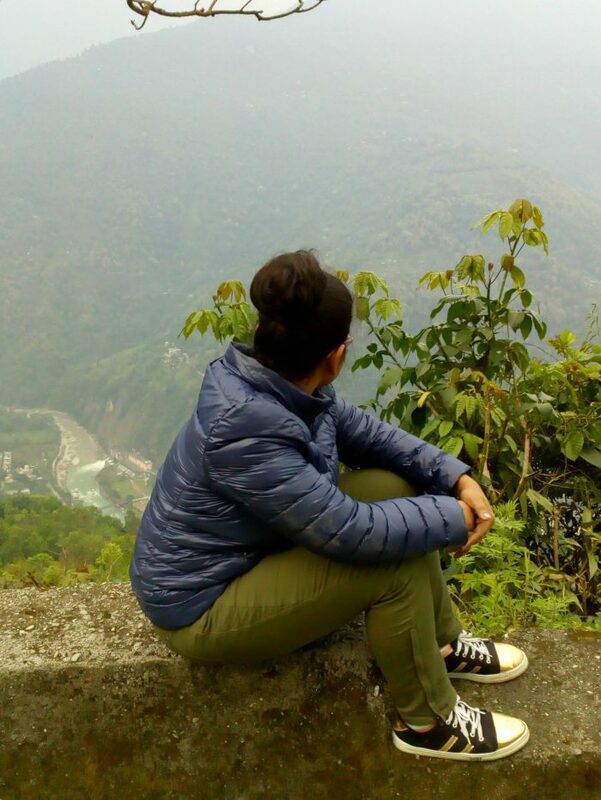 Out I went, the clouds sailing up the mountains, me trying my hands (and legs) at rock climbing, and me sitting in a depressed pose at the valley divided by Teesta River, this adventure was about to come to an end. The next day, as my car went downhill, it felt like I was leaving a part of me behind. I was also taking so many parts of the places I visited home with me. It wasn’t a goodbye it was À Bientôt, until we meet again. So, I haven’t even deleted the number of my guides. “Until next time,” I said to them and until the next time it will be. Cheers to the City of Snowy Peaks.